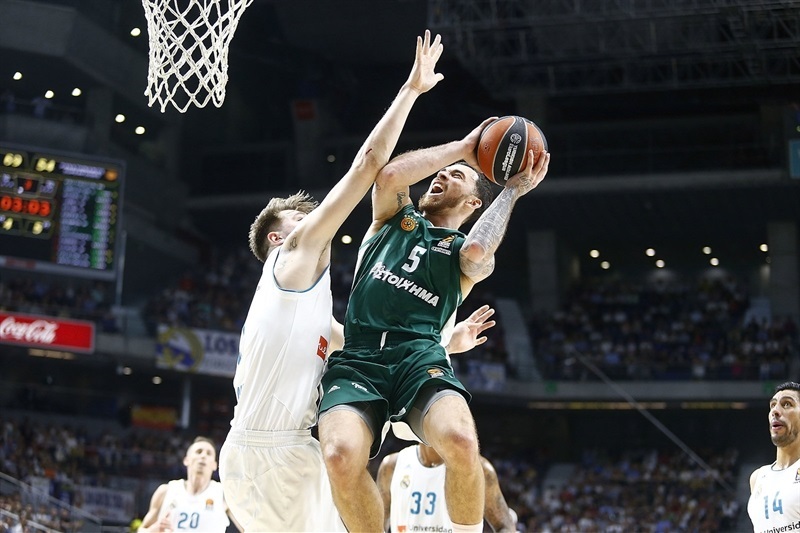 Real Madrid survived a big comeback from Panathinaikos Superfoods Athens to advance into the Final Four with a tense 89-82 victory, sealing a 3-1 series triumph. 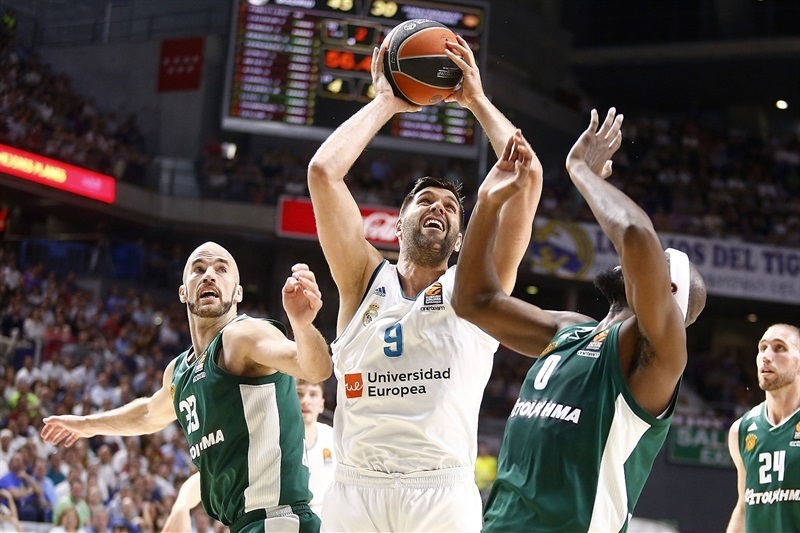 After a closely contested start Los Blancos produced an offensive explosion in the second quarter, with Sergio Llull coming off the bench to spark a run of 30 points in just over 8 minutes. 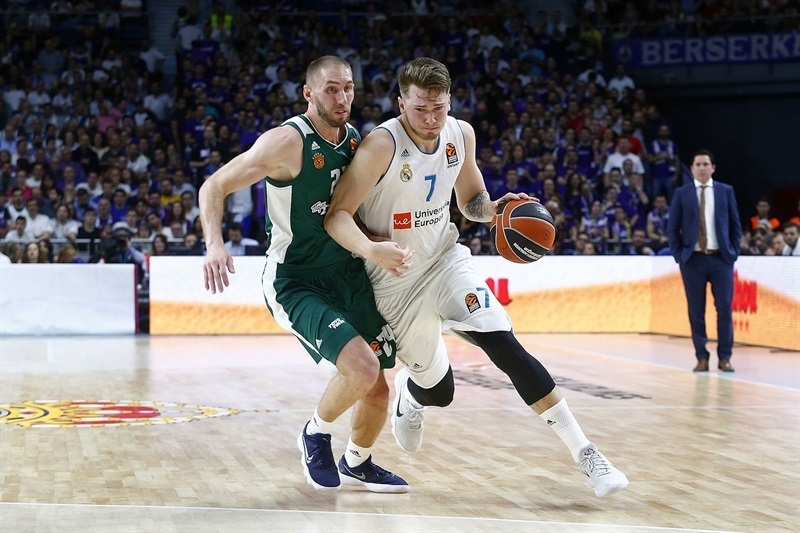 Long-range shooting from Luka Doncic took the lead past 20 in the third quarter, but Panathinaikos showed terrific resilience to fight back and it was 85-82 with a minute remaining, when Doncic sank an outrageous three-pointer to seal the win. 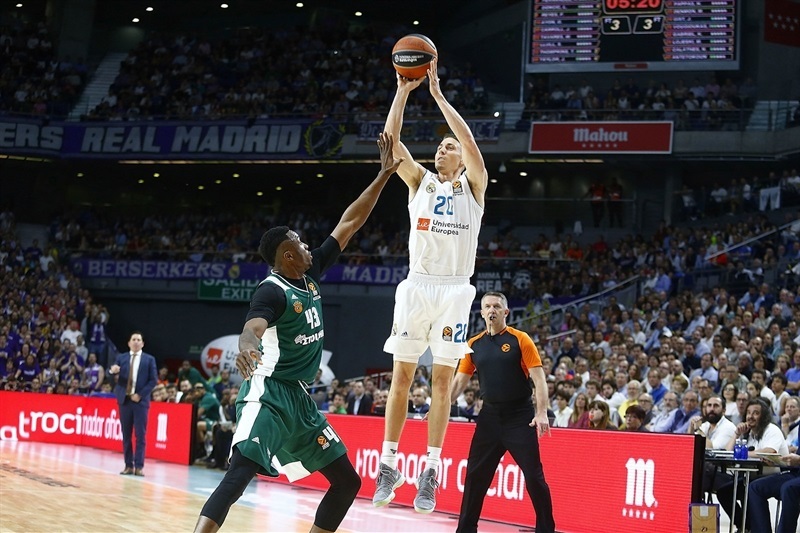 Doncic led Madrid with 17 points including four triples, while Llull had 11 points and 7 assists. 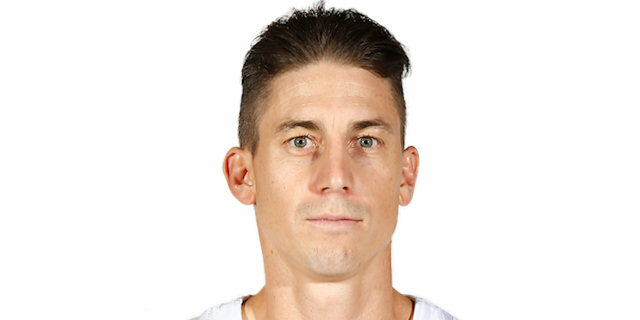 Big men Gustavo Ayon and Felipe Reyes scored 12 apiece, and Jaycee Carroll added 10. 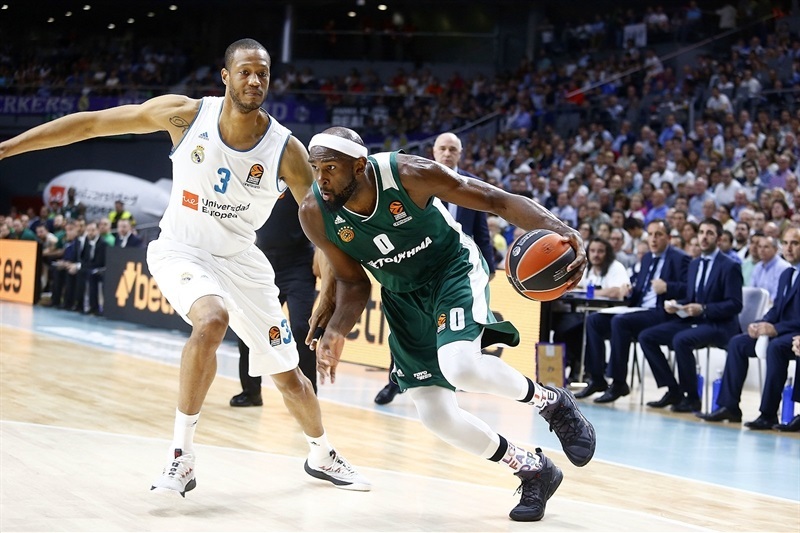 Chris Singleton paced Panathinaikos with 21 points on 5-of-6 three-point shooting. 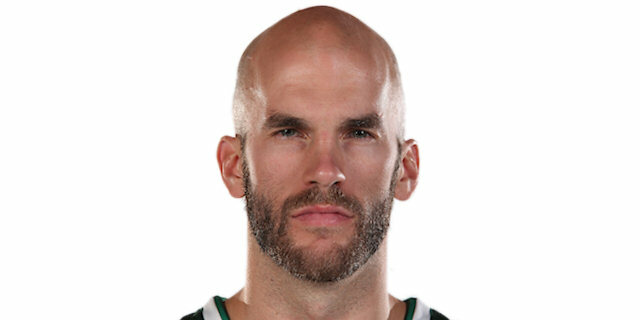 Nick Calathes and Mike James both scored 18 points, and Matt Lojeski added 10. The early stages were closely fought with multiple lead changes. Calathes opened the scoring with a lay-up, before Trey Thompkins responded. Singleton drove to score, Jeffrey Taylor levelled, but James sent Panathinaikos ahead and Calathes added a fastbreak lay-up. Madrid tied it from the foul line before Singleton made the game’s first triple. Then Ayon took over, scoring two baskets and a pair of free throws to send Madrid ahead. 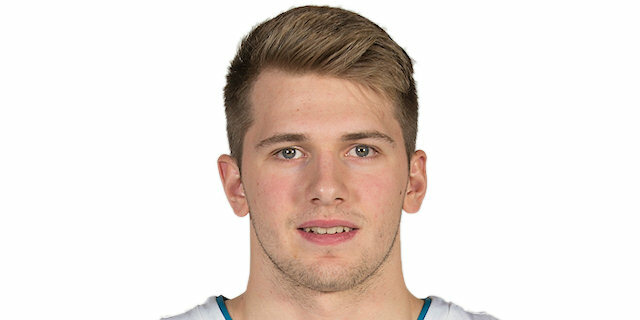 Lojeski and Doncic traded baskets but Ayon added a floater to make it 19-14 after the first quarter. Taylor extended the lead from close range before James went coast to coast, then Anthony Randolph netted a mid-range jumper and Ayon added a highlight reel slam for 25-16. Lojeski reduced the deficit with a triple, and although Randolph netted again that was followed by baskets for James and Lojeski to bring it back to 27-23. 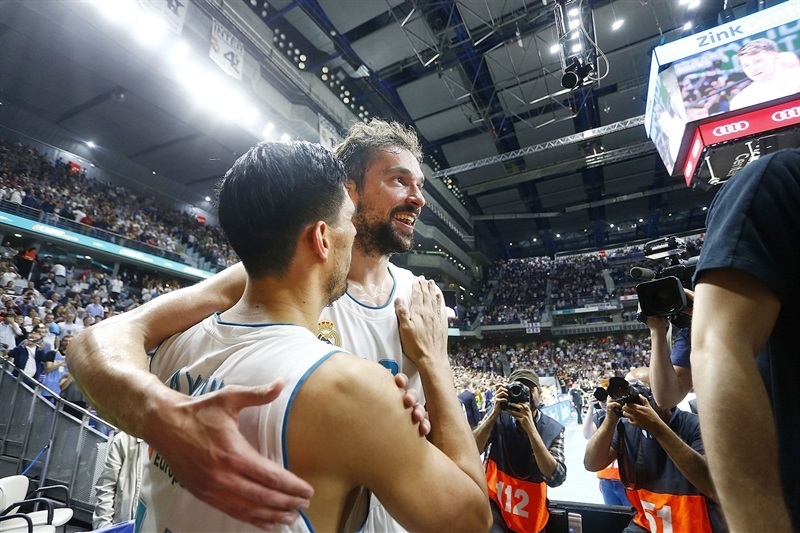 But Llull finally hit Madrid’s first triple and then added another, before two-pointers from Carroll and Reyes gave the home team a 37-24 edge. Carroll soon added another three-pointer and Reyes netted again as the advantage continued to grow, before Payne and Tavares traded fierce dunks. 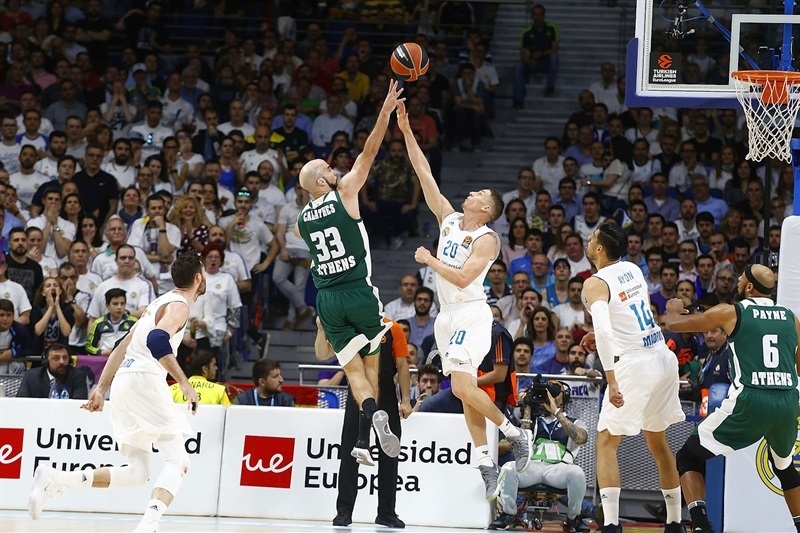 A three-point play from Reyes kept Madrid moving, and after Calathes netted from long-range Rudy Fernandez did the same to make it 51-35 at half-time. 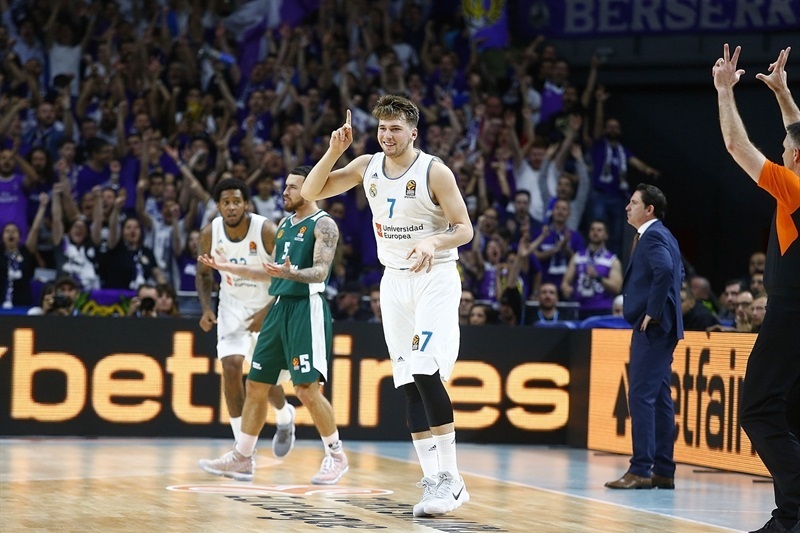 Doncic opened the second half with a step-back triple and soon added another to take the lead past 20 points, and although Singleton responded from downtown it didn’t take long for Doncic to strike from deep again. 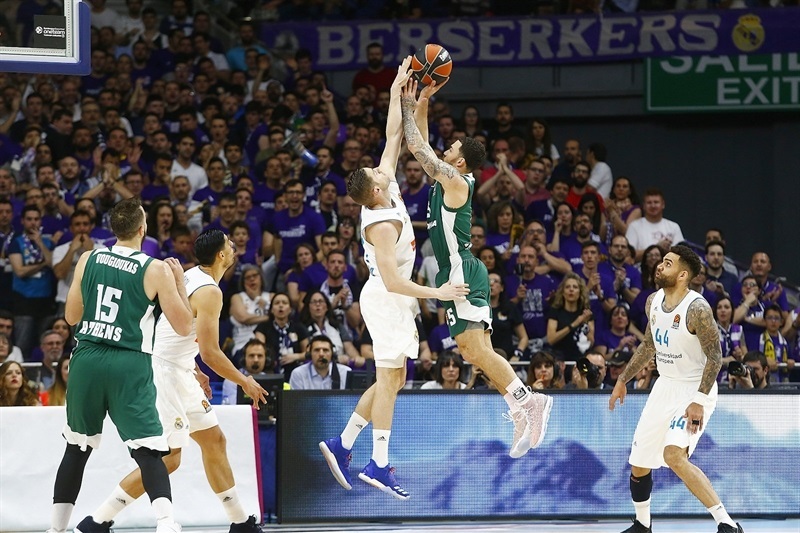 Then it was the turn of Lojeski, James and Pappas to net from distance as the game became a three-point shoot-out, with Panathinaikos pulling it back to 67-52. 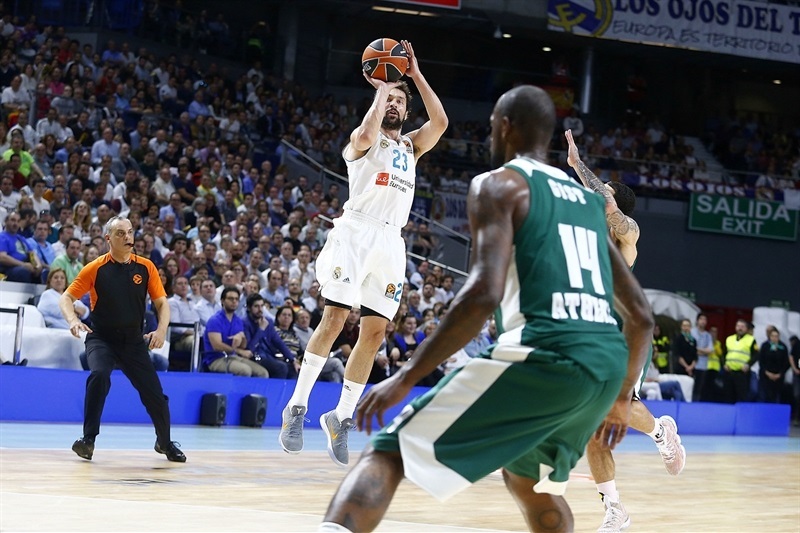 A triple from Thompkins slowed down the visiting team’s charge, and Llull sparked a celebratory atmosphere with a trademark triple for a 78-60 lead at the end of the third quarter. 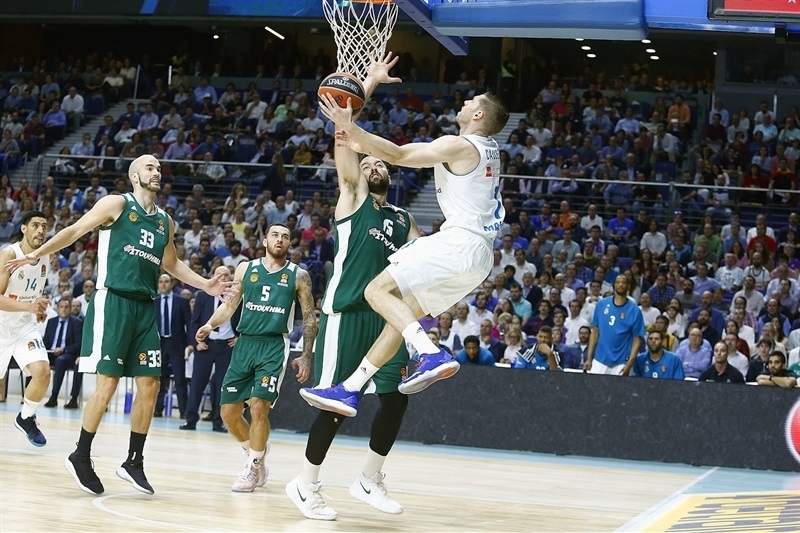 But Panathinaikos gained fresh hope as the final quarter opened with a lay-up from Calathes and a third triple for Singleton. 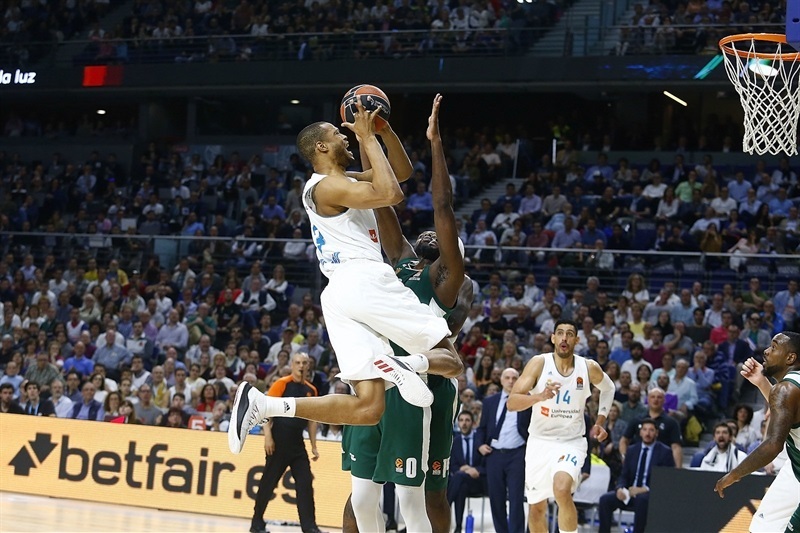 Another long-range strike from Singleton and a fastbreak score for Calathes reduced the deficit to single digits, as Madrid was held without a field goal for more than six minutes. Singleton’s fifth triple made it 80-75, and although Reyes finally stopped the rot from close range, a tip-in by Thanasis Antetokounmpo kept it close. Reyes split free throws and Calathes scored a lay-up for 83-79 with two minutes remaining. 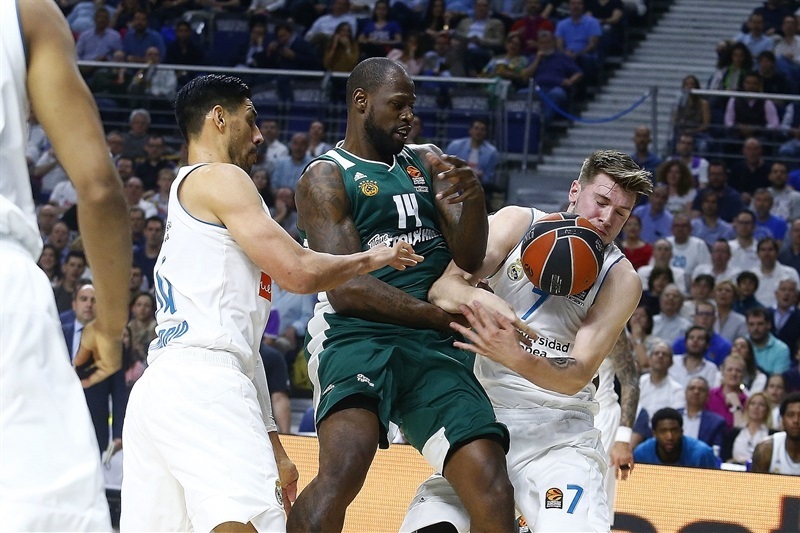 Llull fed Reyes for another basket but Calathes answered from deep to make it a one-possession game, until Doncic struck an incredible buzzer-beating triple to restore a cushion. 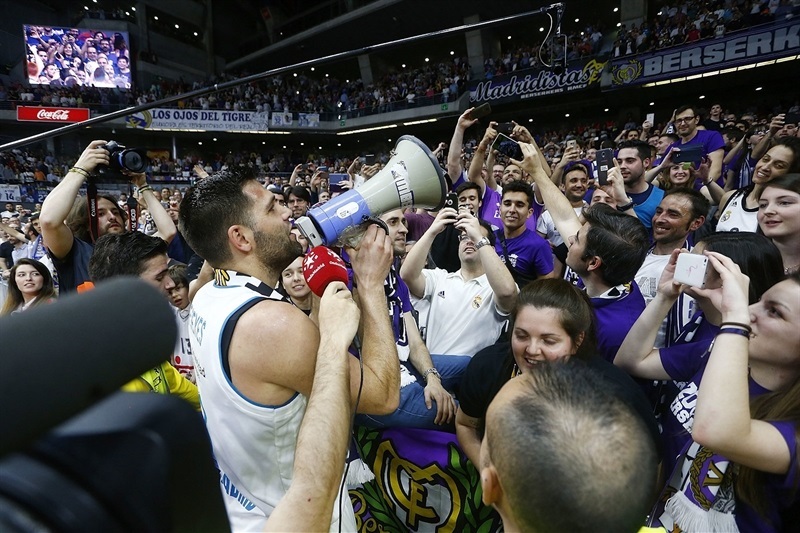 Madrid’s defense held firm the rest of the way, allowing the home fans to celebrate a return to the Final Four. "It didn't go our way. Some plays didn't go our way. 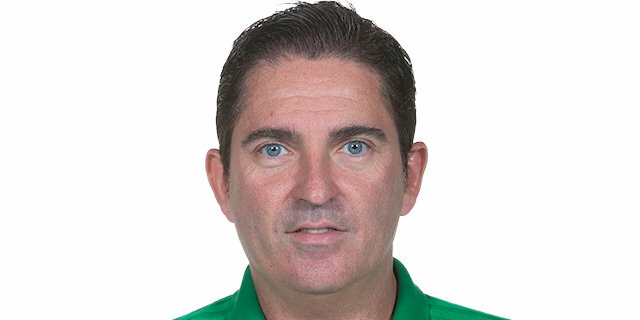 Doncic made a backcourt three-pointer when we were down three. Pap loses the ball, which never happens. On defense we switched and miscommunicated and they got a layup. But they beat us, no excuses. I think our team is better than what we showed in this series, we deserve to be in the Final Four, but in this whole series they made shots late in the shot clock. They scored 40 points in the last 5 seconds of the shot clock, when we played good defense for 19 seconds. We're capable and we were confident, but at the end of the day it's on the court and we didn't get things done."